This grand Victorian West End theatre has been home to The Phantom of the Opera since 1986. Her Majesty’s Theatre is easy to access using public transportation. The nearest tube stations to Her Majesty’s Theatre are Piccadilly Circus (Bakerloo/Piccadilly Lines) and Charing Cross Station (Bakerloo/Northern Lines). The nearest train station is Charing Cross Station. 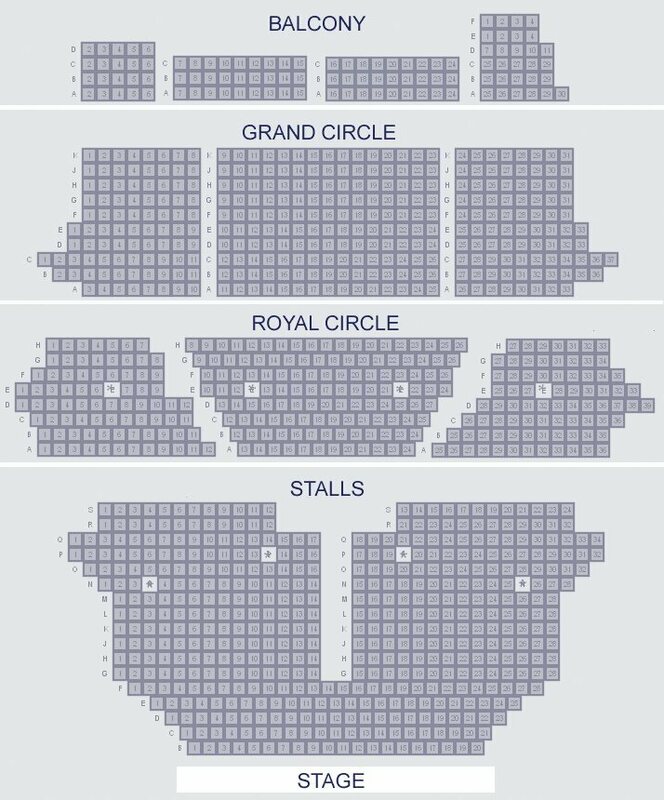 The Theatre Royal Haymarket is serviced by bus lines 3, 6, 12, 14, 15, 22, 23, 38, 88, 94, 159, and 453. The nearest car parks to Her Majesty’s Theatre are the Q-Parks at Leicester Square and Trafalgar. Her Majesty's Theatre, London - book official theatre tickets for The Phantom Of the Opera safely and securely online - great seats available now! Her Majesty's Theatre is a West End theatre, in Haymarket, City of Westminster, London. The present building was designed by Charles J. Phipps and was constructed in 1897 for actor-manager Herbert Beerbohm Tree, who established the Royal Academy of Dramatic Art at the theatre. In the early decades of the 20th century, Tree produced spectacular productions of Shakespeare and other classical works, and the theatre hosted premières by major playwrights such as George Bernard Shaw, J. M. Synge, Noël Coward and J. B. Priestley. Since World War I, the wide flat stage has made the theatre suitable for large-scale musical productions, and the theatre has specialised in hosting musicals. The theatre has been home to record-setting musical theatre runs, notably the World War I sensation Chu Chin Chow] and the current production, Andrew Lloyd Webber's The Phantom of the Opera, which has played continuously at Her Majesty's since 1986. The theatre was established by architect and playwright John Vanbrugh, in 1705, as the Queen's Theatre. Legitimate drama unaccompanied by music was prohibited by law in all but the two London patent theatres, and so this theatre quickly became an opera house.Between 1711 and 1739, more than 25 operas by George Frederick Handel premièred here. In the early 19th century, the theatre hosted the opera company that was to move to the Theatre Royal, Covent Garden, in 1847, and presented the first London performances of Mozart's La clemenza di Tito, Così fan tutte and Don Giovanni. It also hosted the Ballet of her Majesty's Theatre in the mid-19th century, before returning to hosting the London premières of such famous operas as Bizet's Carmen and Wagner's Ring Cycle. The end of the 17th century was a period of intense rivalry amongst London's actors, and in 1695 there was a split in the United Company, who had a monopoly on the performance of drama at their two theatres. Dramatist and architect John Vanbrugh saw this as an opportunity to break the duopoly of the patent theatres, and in 1703 he acquired a former stable yard, at a cost of £2000, for the construction of a new theatre on the Haymarket. He was joined in the enterprise by his principal associate and manager William Congreve and an actors' co-operative led by Thomas Betterton. Her Majesty's Theatre provided the first alternative to the Theatre Royal, Drury Lane, built in 1663 and the Lincoln's Inn, founded in 1660. The theatre's site is the second oldest such site in London that remains in use. On the accession of George I in 1714, the theatre was renamed the King's Theatre and remained so named during a succession of male monarchs who occupied the throne. Her Majesty's Theatre burned down on 17 June 1789 during evening rehearsals, and the dancers fled the building as beams fell onto the stage. Her Majesty's Theatre was rebuilt and reopened on 26th March 1791 with a private performance of song and dance entertainment, but was not opened to the public. Public performances did not start again until January of 1793. Her Majesty's Theatre burned down yet again again in 1867 when, on the night of 6 December 1867, the theatre was set ablaze. Thought to have been caused by an overheated stove, only the bare walls of the theatre remained, and most of the adjacent shops suffered damage. The Royal Opera Arcade, on the western side, survived with only superficial damage. Her Majesty's was designed as a symmetrical pair with the Carlton Hotel and restaurant on the adjacent site. The hotel however, was demolished and the space is now occupied by New Zealand House. The frontage formed three parts, each of nine bays. The buildings rose to four storeys, with attic floors above, surmounted by large squared domes in a style inspired by the French Renaissance. The theatre has a Corinthian colonnade at the first floor, rising to the second, forming a loggia in front of the circle foyer. The theatre lies on an east–west axis. The interior was designed by the consulting architect, W. H. Romaine-Walker (1854–1940). Stalls and the pit were entered at ground level, with two partly cantilevered tiers above accommodating dress and family circles on the first level, and upper circle, amphitheatre and gallery on the tier above. In all, there were 1,319 seats. Contemporary opinion was critical of the project. Edwin Sachs wrote in his 1897 guide to theatres, "The treatment is considered to be in the French Renaissance style and stone has been used throughout. The detail cannot, however, be termed satisfactory, nor does the exterior architecturally express the purpose of the building." Modern opinion of Her Majesty's Theatre is more generous, with English Heritage describing the building as both Phipps' finest work and one of the best planned theatres in London. The building was Grade II listed in January 1970. The facilities of Her Majesty's Theatre naturally lent themselves to a new genre of musical theatre. Chu Chin Chow opened in 1916 and ran for an astonishing world record 2,235 performances (almost twice as long as the previous record for musical theatre – a record that it held until surpassed by Salad Days in 1955). Major productions of plays with large casts were also performed at Her Majesty's. George and Ira Gershwin's Oh, Kay! had its London première on 21 September 1927. This starred Gertrude Lawrence and John Kirby, and ran for 213 performances. Noël Coward's operetta Bitter Sweet enjoyed a run of 697 performances beginning 18 July 1929. J. B. Priestley's theatrical adaptation of his own The Good Companions premièred on 14 May 1931. Musicals continued to dominate at the theatre in the post-World War II period, including transfers of the successful Broadway productions Follow the Girls (1945; 572 performances) and the Lerner and Loewe musical Brigadoon (1949; 685 performances). Leonard Bernstein's West Side Story opened in December 1958 for a run of 1,039 performances, transferring from Broadway via the Manchester Opera House. The Her Majesty's Theatre London premiere of Fiddler on the Roof was on 16 February 1967, starring Chaim Topol, and the production ran at Her Majesty's for 2,030 performances. Forty years after the original stage adaptation, André Previn's musical adaptation of The Good Companions premiered on 11 July 1974, followed by Andrew Lloyd Webber and Alan Ayckbourn's initially unsuccessful collaboration, Jeeves, on 22 April 1975, which has since enjoyed considerable success. John Cleese organised A Poke in the Eye (With a Sharp Stick) as a benefit for Amnesty International at Her Majesty's Theatre in 1976, and it was broadcast as Pleasure at Her Majesty's. This was the first of The Secret Policeman's Balls, organised by and starring such performers as Peter Cook, Graham Chapman, and Rowan Atkinson. The venue was also the setting for the popular ITV1 variety series Live From Her Majesty's, which ran on television from 1982 to 1985. It was on this programme that Tommy Cooper collapsed and died on stage in 1984. The 'boat scene' in Phantom is achieved using surviving Victorian stage machinery. The Phantom of the Opera had its world première on 9 October 1986 at Her Majesty's, winning the Olivier Award for Best New Musical and featuring Sarah Brightman and Michael Crawford, who won an Olivier award for his performance in the title role. The piece is still playing at Her Majesty's, celebrating its 21st anniversary in October 2007 and surpassing 9,000 performances in May 2008. It is the second longest-running West End musical in history (after Les Misérables). Phantom of the Opera had been seen by over 80 million people worldwide and grossed more than £1.8bn ($3.2bn) by 2007, becoming the most successful entertainment project in history. The theatre's capacity is 1,216 seats on four levels. It is owned by Really Useful Group Theatres, which purchased it in January 2000 with nine other London theatres formerly owned by the Stoll-Moss Group. Between 1990 and 1993, renovation and improvements were made by the H.L.M. and C. G. Twelves partnership. Where is Her Majesty's Theatre? Her Majesty’s Theatre has a seating capacity of 1,216 across 4 levels: Stalls, Royal Circle, Grand Circle, and Balcony.